These powerful words concluded a role-play I had just finished with a dynamic young man from Dewitt High School named Liam. Liam was playing a high school student, and I was playing the role of a parent as we acted out a scene where Liam was explaining his plans for the future. He was trying to assuage the father’s doubts about his son’s college plans and potential career choice. Just minutes before, I had asked a yearbook class of about 20 juniors and seniors if they ever felt pressure to live up to their family’s expectations of them. They shared their concerns with each other and the whole group. Earlier in the class, they articulated aspects of their school that they valued and identified areas for improvement. One girl talked about her frustration at the disproportionate amount of attention given to football players compared to student athletes in other sports, such as girls’ tennis. 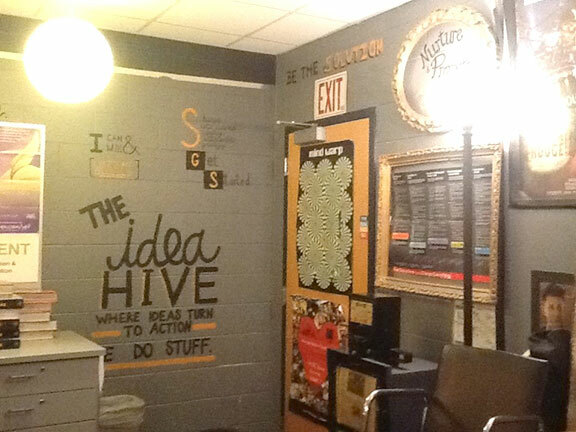 Challenging, personal, transformative conversations happen on a daily basis in the Idea Hive, a classroom space shared by Jeff Croley and Jason LaFay. Jeff teaches drama and yearbook at Dewitt while Jason is an English teacher. Together, the two have created a space that is emotionally and aesthetically remarkable for its atmosphere of authenticity and relevance to the lives of the students Croley and LaFay serve. Upon entering the Idea Hive, visitors are transformed into a deinstitutionalized space that more resembles the comforts of a coffee shop than a high school classroom. Quotes on the walls remind students of the values that infuse this space. I saw concrete evidence of a powerful quote that was prominently displayed on a main wall in the room, “Positive Culture = Positive Results,” when I met Emily. Emily is a student who is very direct and unafraid to speak her mind. Mr. Croley affords students the opportunity to have lunch with him in the Idea Hive and asked if I’d like to join him. Soon after, Emily walked into the Idea Hive to eat lunch, and she mentioned how much it bothered her when kids used the word “retard” or “retarded.” She told me how she wanted “to spread the word to end the word.” I noticed that this was clearly a concern for Emily as she may have been the target of the R-word herself, given her disposition. I asked Emily if she ever considered making a public service announcement video to help spread the word to end the word in support of the already-established international campaign initiated by the Special Olympics. I wondered if they could play it on the monitors at Dewitt High School to help educate the students. Jeff added that he’d certainly be willing to help make this happen. After spending just a couple of hours in the Idea Hive, I am certain that this kind of empowerment happens constantly in this space. Students have an idea that matters to them – and others – and they are able to express themselves with passion and confidence. There is great agency here. Student voice and choice is clearly valued, all with the purpose of improving the quality of life in the local school and larger communities. It is clear to me that the Idea Hive is certainly a place where ideas turn into action. Students’ voices are honored daily. Jeff Croley ponders a thought in the Idea Hive.